No matter what they say, hibernating Linux laptops has always been a problem. I managed to get my MacBook to suspend to RAM quite reliably without much of a hassle. It suspends when I close the lid, and it resumes when I open the lid back. I even configured it to suspend when battery is critically low. This way, and due to the really low power consumption while suspended, I can safely forget my laptop on and unplugged for extended periods of time, and the worst that can happen is that I will have to resume it. A huge difference from the nasty surprise of finding it off and losing all the information not saved to disk. However hibernating to disk is a whole different business. I never managed it to work, and that was an itch I wanted to scratch. Finally I managed, with the following recipe. First, make sure that you have enough swap space available in disk. In Linux you generally create a swap partition when installing the OS. The old adage states that one should make the swap partition twice as big as the RAM memory of the computer. With modern computers this is both unnecessary (because the big RAM makes sure you'll never run out of it, and if you do, you are screwed anyway) and wasteful (if you have a 4GB RAM, it means that you dump 8GB of disk space). However, if you intend to hibernate your computer, all the information in the RAM memory has to be copied to the hard disk, so you sure need at least as much swap as RAM (but not twice). Second, you need to use the correct tool. I use Xfce as desktop environment under Ubuntu, and the Exit menu presents me with six options: "Switch user", "Log out", "Restart", "Shut down", "Suspend" and "Hibernate". I think that the latter two make use of the tools in the acpi-support package. The suspend action seems to work OK, but the hibernate one doesn't (for me). It runs the command /etc/acpi/hibernate.sh, and it gives me problems. Thankfully I found some utilities that work reliably, namely pm-utils. The pm-suspend command seems to work as correctly as the "Suspend" button in the Exit menu of Xfce. The pm-hibernate, on the other hand, works perfectly, unlike the "Hibernate" button. The drawback is that only root can run it. My solution is to put a launcher button in the Xfce task bar, that will run "gksudo pm-hibernate". This way I am asked for my password and, if sudo is correctly set up, pm-hibernate will run. # remains frozen upon awakening. 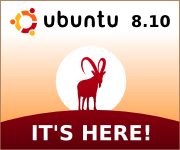 Ubuntu 8.10 Intrepid Ibex is here! As you can see on the right side tab of this page, Ubuntu 8.10 has just been released! Pick a mirror and download. Or better yet, do it through BitTorrent.